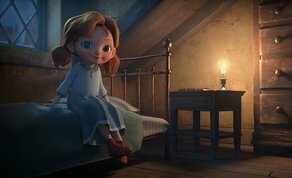 Dublin-based animation studio Brown Bag Films has received three Daytime Emmy Award nominations for ‘Angela’s Christmas’. The nominations include a nod for Ruth Negga’s voice performance in the Best Outstanding Performer in an Animated Program category. The show was also nominated in the Outstanding Writing for an Animated Program category for Will Collins (‘Song of the Sea’, ‘Wolfwalkers’) and Damien O’Connor’s (‘Anya’, ‘Doc McStuffins’) work and in the Outstanding Sound Mixing For An Animated Program. The half-hour CG film is based on Frank McCourt’s only children’s book inspired by a story his mother Angela told him as a child. In 1997 McCourt won the Pulitzer Prize for his best-selling memoir, Angela’s Ashes. Set in Ireland in the early 1900s, Angela's Christmas is a funny, heart-warming and poignant story about the power of family and the innocent desire of a child to ensure everyone is safe, warm and loved at Christmas time. The film stars Oscar-nominated Ruth Negga (‘Loving’, ‘Preacher’) in the role of Angela’s mother, and Lucy O’Connell (Oscar-nominated ‘Song of the Sea’) as Angela. The film is written by Will Collins (‘Song of the Sea’, ‘Wolfwalkers’) and Damien O’Connor (‘Anya’, ‘Doc McStuffins’), and directed by Damien O’Connor. Ellen McCourt, Frank’s widow, serves as an Executive Producer on the project and Malachy McCourt (‘Brewster’s Millions’, ‘The January Man, One Life to Live’), Frank McCourt’s brother, an Irish-American actor, writer, and politician, provides the narration. The film also features an original song from Irish singer-songwriter Dolores O’Riordan. ‘Angela's Christmas’ was developed with the support of Fís Éireann/Screen Ireland and produced by Brown Bag Films with the support of the Broadcasting Authority of Ireland, Fís Éireann/Screen Ireland and RTÉ. 9 Story Distribution International holds worldwide distribution rights. Angela’s Christmas is currently available on Netflix.